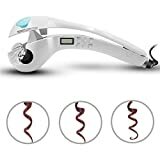 DIY at home by yourself, modeling lasting, perfect curls.Safe, easy to operate, advanced heating device, can be used in a few seconds temperature.High-quality plastic shell, hair zero damage, 2 colors for your choice, with detailed instructions. Spray water, curly hair at the same time to provide water to reduce hair loss in the high-temperature state of the hair dry easily broken bifurcation phenomenon occurs, and really do not hurt the hair, nourish hair core. Through the combination of temperature and time direction of the hair, you can experience different shapes. A key to select the curl direction and curl degree, easy to create the outer or inter volumes, large or small volumes. Ceramic rod core heating evenly, heating chamber temperature control, so that all-round hair to accept the heat to maintain the hair moist and bright. Anti – scald and anti – shock design.Fast, save money, security, hair care, diversity.Automated curly hair experience. 170°-Suitable for delicate fluffy hair-Gentle care. 190°-Suitable for medium thickness hair-Lasting stereotypes. 210°-Suitable for thick and dense hair-Strong stereotypes. 0s-No ring.Remind only after hair has been involved in continuous heating for 15s. 8s-Natural waves /for loose waves.Ring 3 times,the last continuous ring 4 times that is complete. 10s-Soft curl / for soft curls.Ring 4 times, the last continuous ring 4 times that is complete. 12s-stylish charming / for more defined curls.Ring 5 times, the last continuous ring 4 times that is complete. NOTE:The longer the use, the more the hair volume. Always use the spray curler with the LCD monitor facing the face. 1.Keep your hair clean, dry, and comb your hair straight. 2.Dividing your hair into left and right sights, if the hair is very thick, you still need to divide your hair into up and down two layers. 3.Soft hair needs to be transferred into low temperature, short time function. 4.Coarse hair needs to be transferred into high temperature, long time function. 5.When using the spray curlers, let the reel toward you while the light outward, put into a finger thickness of the hair, not too much, to prevent stuck hair and to reduce the curling effect. 10.Plug in the outlet, you will see the power button to the right of the red light starts to flash, to reach the preset temperature after the light. The curlers are automatically powered down after 72 minutes. NOTE:Please read the operating instructions carefully before using the equipment. This entry was posted in Hair Products and tagged Automatically, beauty, Care, Curlers, Dazone, hair, Ions, Negative, ScreenRed/White, White by Hair Growth Tips. Bookmark the permalink.